Hi! Thanks for the opportunity to share my first oil painting! 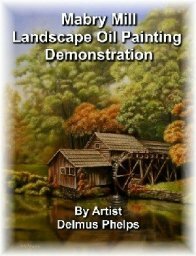 I watched Delmus' videos and found them inspirational & instructional!! 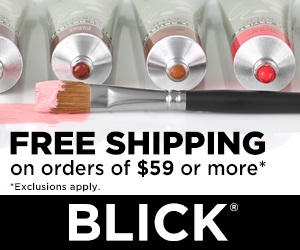 Enough so to give me the courage to give oils a try! I found a lovely photo on a site - paintmyphoto - submitted by a member, Biba. As soon as I saw the photo I knew it had to be painted! I found the step by step approach to layers in the Flemish technique very useful - the most difficult layer for me was the color layer - perhaps due my lack of training in color theory? I found that placing the source photo under my glass palette was really helpful - I did a lot of mixing & tossing before I came up with a pretty decent match!! I now have "oil in my veins" and can't wait to try another!! Please forgive my untimely response to the many wonderful comments! I truly appreciate you taking the time to look and comment on my work! This was my first oil painting and remains a favorite of mine! Thanks also to Delmus for share the information that helped me make this happen! This particular one literally did blow my brains. It took me a minute to realize that it was just an oil painting of oranges. The originality with which he has created the painting is so brilliant. Even the light rays have been duplicated as such in here. Congratulations on a beautiful painting! You truly inspire the rest of us beginners! Thanks so much Delmus! I couldn't have done this without your help!!! 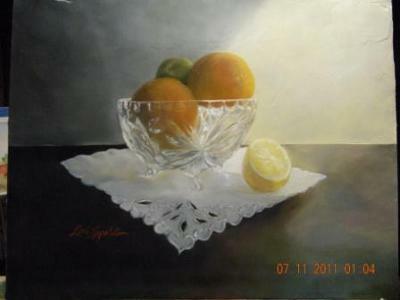 Oil painting of crystal and fruit, a showcase winner! Congratulation on this big win! This is also a big plus to add to your resume, and will add value to the work. Most folks just skim read through some of these comments and submissions, so I will repeat something that folks may have over looked. This is Lori's FIRST OIL PAINTING! And it is a PRIZE WINNER. This shows both the determination and skill of the artist, and the technique behind the artist. Great job Lori, can't wait to see your next project! In the Oil Painters of America Online Contest 2012!!! Thanks to all who have taken the time to look and comment! I truly appreciate your support and encouragement! Your painting is lovely and full of light!! Thank you for the very kind comments!! It's a great feeling to share my artwork with you!! I appreciate the very kind comments!! It's a great feeling to share my art with you!! very nice lori. like it a lot. Another beautiful work of art, just like the artist who painted it. enjoy looking at it. Keep painting. The glass bowl is excellent. You have put in lot of effort that the lace gives the appearance of a plastic tray. Keep it up. Thanks for sharing your artwork.